Evo Race is our hi-performance oriented jersey. This jersey will be especially suitable for racing and training, and sure for coffee and cakes! 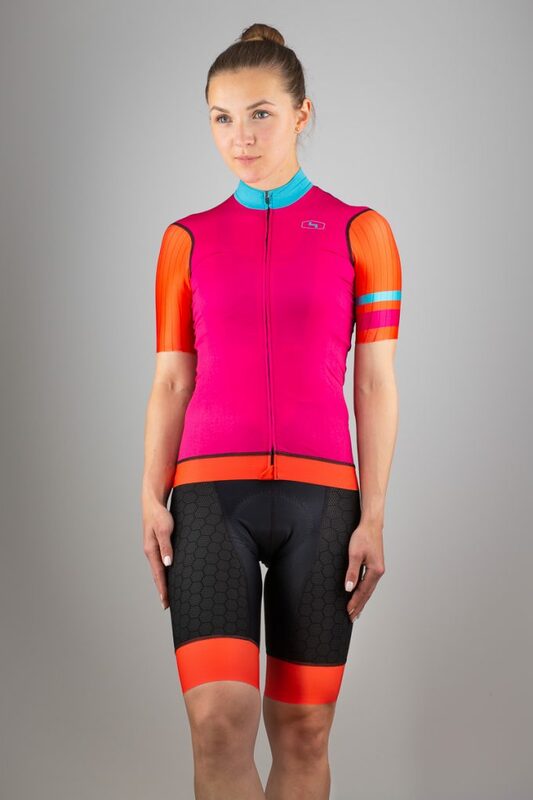 Evo Race Lollipop women’s cycling jersey is light, breathable and super comfortable! It’s not only a new name, but it’s also a new cutting and technologies! We developed these jerseys over several seasons. Therefore the Evo line is our hi-performance oriented. This jersey will be especially suitable for racing and training, and sure for coffee and cakes! Carefully selected materials, the perfectly worked cutting and proven fittings ensure a very comfortable use of Evo Race Cycling Jersey. Our main goal in designing the jersey was to maximize aerodynamic benefits without sacrificing riders’ comfort. We made the Evo Race Lollipop women’s cycling jersey of highly breathable materials, so it will be suitable for warm weather. We made the front of the jersey of ultra-light and soft 4-way stretch lycra. The back of the jersey uses a similar material with extra perforation, which gives a very fast moisture outlet. The jersey’s hand is of lycra with longitudinal structure. This lycra is tested and optimized in the wind tunnel. It helps to reduce air resistance.